I Just Got Here and My Parents Already Want to Visit -- Help! After 18 or so years, you are finally on your own, your family has moved you into your dorm at Ithaca College, and you flop down on your bed to get to know your new roommate, when your cell phone rings. It's your mom, telling you she has already planned weekends for your family to visit! Don't panic yet. While you may want time to adjust to your new life, think about how your parents and family feel. Whether you are the first, last, only, or most recent child to go off to college, everyone at home is going to miss you. Use our guide to help balance the fun and freedom of your new life with your family's desire to see you again! Move-in is the perfect time to get acclimated to the city of Ithaca and your new college campus while still having the comfort of your family around. Take a look at our Fuse map and discover more than 130 places around Ithaca to dine, shop, and explore. Some of our favorites: Taste of Thai, the Moosewood, and the Boatyard Grill for eating and the Commons and Ithaca Mall for shopping. Especially if you are the oldest, or the first off to college, your siblings are going to want to come visit. Ithaca students have seen it all, from the older brother crashing at your place to the little sister desperate to get a look at what college will be like. So embrace it -- some of the best weekends at school can come from showing visitors around campus. Take your siblings to a show, treat them to brunch in a dining hall, and, especially if they're interested in becoming a student at IC, let them come to class with you. Professors are fantastic about showing prospective students what class is like. For most students, the first time they see their parents, siblings, and loved ones is at Ithaca’s Family Weekend. So book them a place to stay, break out the cameras, and get ready for their visit. 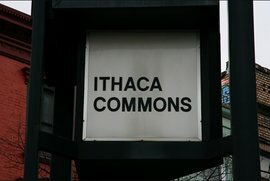 Ithaca offers a ton of activities during this weekend, including exhibits at the Handwerker Gallery (the campus art museum), screenings of student films, athletics open houses, choral concerts, and even family climbs on the fitness center’s rock wall. Why not take your family to . . .
You may be annoyed that your family wants to see you right away, but remember that they miss you! Plus, with so many things to do in town and on campus, you can bring your new friends along with you to experience Ithaca and hang out with your family.